Games Girls Play by Sports Pyschologist, Caroline Silby, Ph. D.
A Reviving Ophelia for soccer moms: Games Girls Play gives parents advice for encouraging their daughters to participate in sports and making sure their experiences as athletes are empowering. Sports psychologist and former nationally ranked figure skater Caroline Silby teaches parents how to find the right sport for their young daughters and helps them tackle hurdles that affect older atletes. Using real-life examples, Silby prepares parents for the obstacles that female athletes face and offers solutions for handling everything from the stresses of competition, to motivation problems, to self-esteem issues, to difficult coaches, to eating disorders, to sexual harassment. 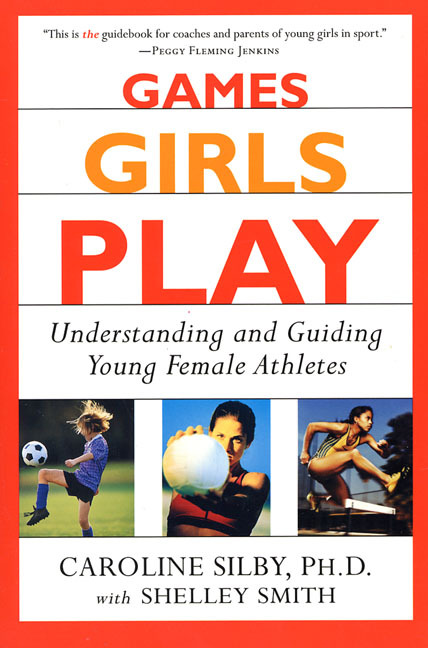 Practicing sports psychologist Silby, who serves on the United States Olympic Committee, and ESPN journalist Smith direct this book toward the parents of teenage girls who, although sharing many sports issues with boys, also have specific concerns, such as decreasing assertiveness and ambivalence over physical maturation. Silby discusses many topics (e.g., What if a coach plays favorites? ) and portrays many of her case studies, complete with dialog. The authors devote much attention to helping the young female athlete differentiate between what can and can!t be controlled and provide mental exercises (e.g., self-talk, reframing, and imagery) to help her performance.